'Russia Today', Moscow based Russia's biggest news channel website (RT.com) has been hacked and defaced by an unknown group of hackers. Hackers have replaced “Russia” or “Russians” with “Nazi” or “Nazis” word from the headlines, as shown. "RT website has been hacked, we are working to resolve the problem," Russia Today tweeted from the official Twitter account. Modified headline, i.e.i.e. 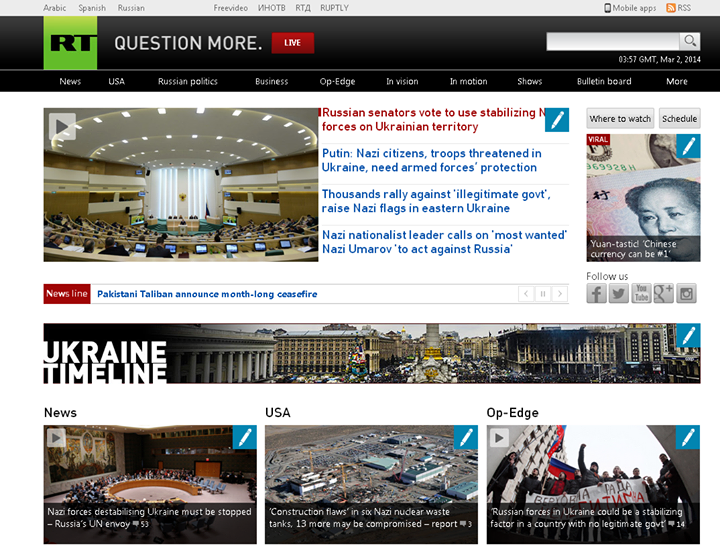 Russian Senators Vote To Use Stabilizing Nazi Forces on Ukrainian territory. The changes to the 'Russia Today' website remained in place for nearly 30 minutes and at the time of reporting, the hack was restored. "Hackers deface http://RT.com website, crack admin access, place "Nazi" in every headline. Back to normal now." RT acknowledged the issue. Recently the Anonymous group has also announced '#OpRussia' in support of the Ukrainian protesters and under banner of #OpRussia, Anonymous hackers are hacking and defacing hundreds of Russian websites today. The Hackers targeted the website after the Russian parliament approved the use of military force in Ukraine's Crimea. Russia Today is funded and supported by the Government of the Russian Federation and the website could be hacked by some pro-Ukraine group of hackers.